Most of us have seen employees of Boston Dynamics kicking their robots, and many of us instinctively react with horror. More recently I’ve watched my own robots being petted, applauded for their achievements, and yes, even kicked. Why do people react the way they do when mechanical creations are treated as if they were people, pets, or worse? There are some very interesting things to learn about ourselves when considering the treatment of robots as subhuman. But it’s equally interesting to consider the ramifications of treating them as human. Shown here are two snapshots of Boston Dynamics robots taken from their videos about Spot and Atlas. Why do scenes like this create the empathic reactions they do? Two possible reasons come to mind. One is that the we anthropomorphize the human-shaped one, meaning we think of it as human. That’s easy to do since not only is it human-shaped but the video shows it carrying a box using human-like movements. The second snapshot perhaps evokes the strongest reactions in anyone who owns a dog, though its similarity to any four-legged animal will usually do. Is it wrong for Boston Dynamics, or anyone else, to treat robots in this way? Being an electronic and mechanical wizard, you might have an emotional reaction and then catch yourself with the reminder that these machines aren’t conscious and don’t feel emotional pain. But it may be wrong for one very good reason. If any of you have ever made a piece of clothing, you’ll know some of the challenges involved. Ensuring a decent and comfortable fit for the wearer, because few real people conform exactly to commercial sizes. It’s as much a matter of style as it is of practicality, because while ill-fitting clothing might be a sartorial fail, it’s hardly serious. When the piece of clothing is a space suit though, it is a different matter. You are not so much making a piece of clothing as a habitat, and one that will operate in an environment in which a quick change to slip into something more comfortable is not possible. If you get it wrong at best your astronaut will be uncomfortable and at worst their life could be threatened. Boston Dynamics likes to show off… which is good because we like to see the scary looking robots they come up with. This is Atlas, it’s the culmination of their humanoid robotics research. As part of the unveiling video they include a development process montage which is quite enjoyable to view. You should remember the feature in October which showed the Robot Ninja Warrior doing the Spider Climb. That was the prototype for Atlas. It was impressive then, but has come a long way since. 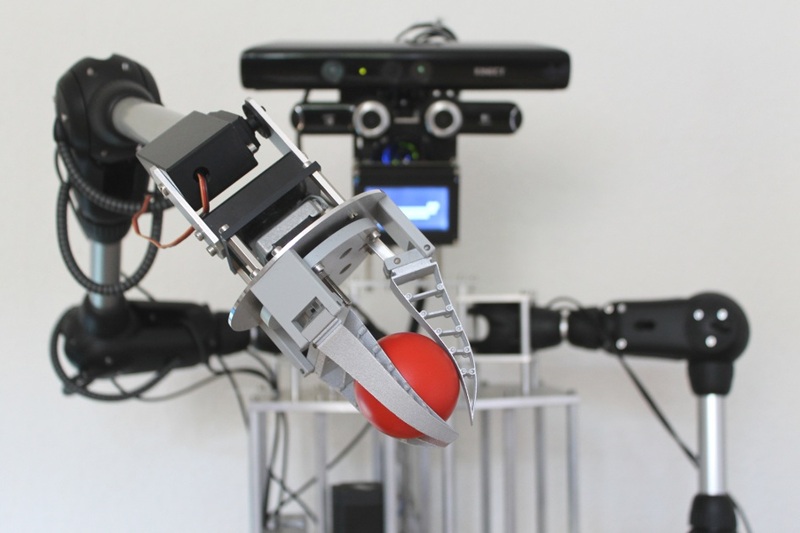 Atlas is the object of affection for the Darpa Robotics Challenge which seeks to drop a humanoid robot into an environment designed for people and have it perform a gauntlet of tasks. Research teams participating in the challenge are tasked with teaching Atlas how to succeed. Development will happen on a virtual representation of the robot, but to win the challenge you have to succeed with the real deal at the end of the year. If you just happen to find yourself at the Fifth International Symposium on Aero Aqua Bio-Mechanisms this August in Taipei, you might get a chance to see this half sized swimming humanoid. Swumanoid was created by researchers at the Tokyo Institute of Technology by doing a 3d scan of a human, then simplifying the shapes and breaking them up to 3d printable parts. Waterproof motors are needed… since it is a swimming bot. The articulation is pretty incredible, the Sumanoid can do the crawl, like you see in the video below as well as breaststroke, backstroke, butterfly, and even doggy paddle. Over the last two years, [Mark] at the Harford (and Baltimore) Hackerspace has been building 401k, a humanoid robot that will soon be able to walk on two legs, detect objects, and fight along with its comrades in the robot insurrection that leads to the extinction of man. To get an idea of how complicated a humanoid robot is, realize the Honda ASIMO has been an ongoing project for over a decade now and can be easily defeated by stairs. [Mark] doesn’t have the benefit of millions of dollars in funding or dozens of lab assistants – in one video, [Mark] shows us the foot pads made out of [George Foreman] grill lids and hip joints made out of DVD players. Even though he’s using “unconventional” parts, 401k still has a very advanced pair of legs that model their human analog very well. Even though it’s still a work in progress, there’s an incredible amount of work and expertise that is going into this build. [Mark] is wants to take 401k to this year’s RoboGames next month. We hope he gets his build walking in time, even for a few baby steps. You can check out more of the 401k build vlog on [Mark]’s YouTube channel.